Some call them rising stars. Some call them up-and-comers. Some call them movers and shakers. We call them ALUMNI! The Alumni Office is seeking nominations for the inaugural Jag20, Georgia Regents University’s Emerging Alumni Leader awards that will honor 20 outstanding alumni under the age of 40 who have made a significant impact in their field, community, state, or the nation. The Jag20 will be honored during Alumni Weekend, April 24-27, 2014. Be sure to nominate an exceptional alumnus today! Online nominations will be open through the beginning of January. 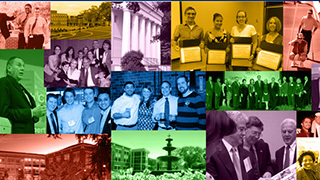 Nominate an alumnus online, by visiting grualumni.com/Jag20.